Inverter Control Booster Systems applications: Water supply for IC manufacture industries, industrial pressure boosting systems, motels, restaurants, gas stations, apartments, factories, schools, parks, gymnasiums, villas, railway station, temporary building sites, etc. Introduction of Inverter functions: This equipment can calculate and export analog continuous signal to inverter according to system pressure variation, sense the difference between the signal and microcomputer constant pressure controller setting. The inverter will change frequency again by the variation of 4-20MA.The pump motor speed changed according to the variation of frequency to achieve the major function of constant pressure and other function such as shut down during no incoming water, no water hammer, delay start up/stop etc. 1. 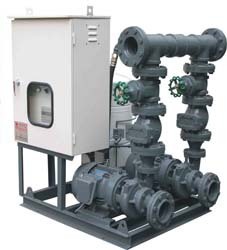 Customers can choose the capacity of pressure tank, pump model, inverter quantity, and pump quantity. 2. Dry-running detection. It will turn off in 15 seconds automatically once there is no water to avoid motor burn out. 3. Adopts high quality inverter which has high efficiency and slow start-up/stop functions.